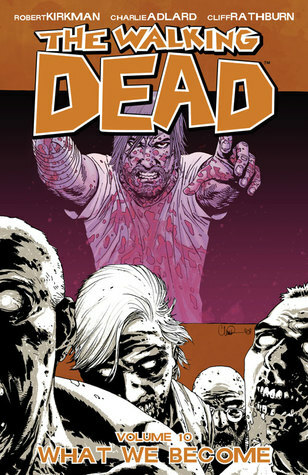 The tenth volume of The Walking Dead includes issues 55-60. It continues the story of the survivors of the original group, as well as the new trio, as they head for Washington DC. They're on the road and camping whenever they need to. When Rick suggests they stop by his old town so he can pick up some more ammo from the police station, Abraham goes with him. They also take Carl, and while he's there Rick visits Morgan. Which was really cool but also very sad. I was so horrified to see what had happened to Duane. Still, Morgan goes with them and becomes part of their group. This series is unbelievable. Seriously demented stuff that I'm totally hooked on. I can't stop reading. I have to know what's waiting around the corner for Rick. And I really like Carl. Tough and brave kid. Not to mention that I enjoyed the exchange between Rick and Abraham--two men who will do whatever it takes to stay alive and keep those around them safe.